Today was the first real work day. We spent the morning and a session in the afternoon in "Indaba" Groups--which are groups of 40 bishops from all over the communion. This is how it's defined: "In Indaba we must be aware of [the current] challenges (issues) without immediately trying to resolve them one way or the other....The purpose...is to find out the deeper convergences that might hold people together in difference...."
We spent the morning on "The Bishop and Anglican Identity" and the afternoon on the Five Marks of Mission: proclaim the Good News; teach, baptize and nurture new believers; respond to human need by loving service; seek to transform unjust structures of society; strive to safeguard the integrity of creation. I was heartened by the common commitment to these five marks as well as the diversity about how we seek to achieve them. Despite our geography, our objectives are congruent. If this conference is successful, then we will dedicate ourselves to helping one another with the mission of the Church. In the evening we heard Brian McLaren, author of A Generous Orthodoxy. He challenged those in the West, the South, and the East to get on with the task of proclaiming the Good News of Jesus Christ. For those of us in West, he reminded us of the shrinking numbers of church goers in Europe and the USA. We could spend our time on "division, diversion, or implosion," or we could get on with our task. I came away with a reminder of how we must remember that our connection to God in Christ has primary importance in our lives. Jesus Christ is not want occupies our Sundays; He is at the center of everything. That shift pushes us to cease focusing on the running the church machine and instead motivates us to share the Good News by word and example. It's why the Diocese of WNC has been working on the project Daily Practices for God's People. Christianity is about being transformed and being an agent of God's transformation of the world. 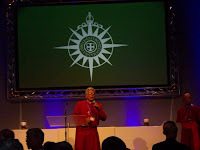 May hope is this conference will continue its focus on mission, for our sakes and for the world's. Keep all of us in your prayers.